In Russia's Vast Far East, Timber Thieves Thrive : Parallels The demand for Russia's high-value timber is fueling organized crime, government corruption and illegal logging. The hardwood often ends up as flooring and furniture in the United States, Europe, Japan and China. 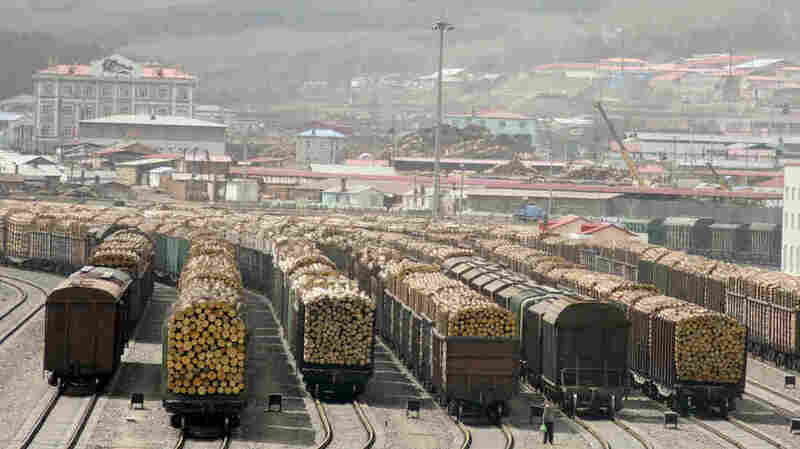 The Chinese border town of Suifenhe is a port of entry for almost all of the hardwood coming from the Russian Far East. Russia is the world's largest exporter of timber, but illegal logging is a growing problem. Forests cover about half of Russia's land mass, an environmental resource that President Vladimir Putin calls "the powerful green lungs of the planet." But Putin himself acknowledges that Russia, the world's biggest exporter of logs, is having its timber stolen at an unprecedented rate. The demand for high-value timber is fueling organized crime, government corruption and illegal logging in the Russian Far East. The hardwood cut in the endless forests often ends up as flooring and furniture in the United States, Europe, Japan and China. At a meeting on timber management earlier this year, Putin said that illegal logging has increased by nearly 70 percent over the past five years, and he added that timber thieves have no problem selling their product. Illegal loggers are often linked to violent organized crime, and together, they undermine what officials say could be sustainable forests and contribute to Russia's endemic corruption by paying off local officials. But there's another reason illegal logging is considered a threat in the Far East. "This provides an important habitat, both in terms of shelter and food, for such unique animals as the Amur tiger. 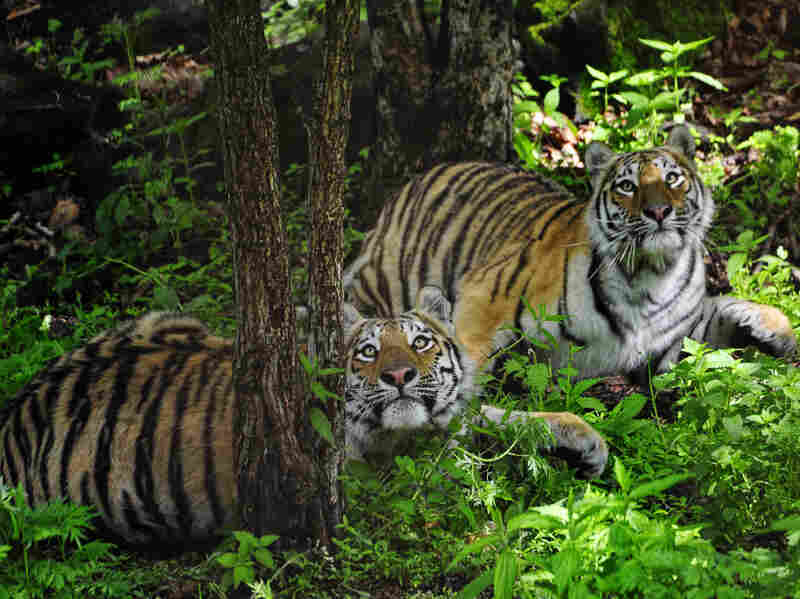 Only about 450 of these beautiful animals are left in the wild," says Nikolay Shmatkov, the forest policy projects coordinator for the World Wildlife Fund in Russia. The Amur tiger, more commonly called the Siberian tiger, is known throughout the world as one of the largest living members of the cat family. It preys on deer and wild boar, which in turn live on acorns and walnuts that grow in one of Russia's most diverse forests. But oak and walnut wood are highly prized for flooring and furniture, and are targets for illegal loggers. Shmatkov says that timber can be stolen outright from the tiger's habitat, but he notes that much of it is taken by companies with valid logging permits. They cut much more than they're allowed to, or they cut species that aren't permitted. A U.S.-based environmental group, the Environmental Investigation Agency, or EIA, recently released a report that traces illegally cut timber from the source to the consumer. "We found out that the vast majority of it first goes into China, which is right next door, into their manufacturing centers, and in products of any type you can imagine, as it spreads around the world," says EIA's executive director, Alexander von Bismarck. Von Bismarck says the team set up a dummy corporation and posed as buyers of wood flooring. They recorded conversations with a Mr. Yu, an executive of a large Chinese wood products company called Xingja. "He openly described the types of illegality in the supply chain — that he cuts illegally on his own land, which is a common method that is destroying the forest there, and he talked about corruption and how he used that to stay out of trouble," von Bismarck says. When an NPR reporter in China recently contacted Mr. Yu by telephone, Mr. Yu charged that the allegations in the EIA report were "all lies" and said he would take the matter up with his government. The EIA report makes another allegation that involves the Chinese company's biggest American customer, Lumber Liquidators. Von Bismarck says Lumber Liquidators bought flooring from Xingja, and that it should have known that the flooring was made from illegally logged wood. That's a serious allegation, because a U.S. law called the Lacey Act prohibits American companies from buying illegally cut wood products from other countries. The law puts the burden on U.S. companies to actively determine, as best they can, that the products they buy come from legal sources. Lumber Liquidators' founder and CEO, Tom Sullivan, says the report is inaccurate and that its claims are not substantiated. "If we had any knowledge of any mill of ours buying from an illegal source or a nonsustainable source, we immediately would not buy from them," Sullivan says. "We are extremely pro-active in making sure that all our materials are from legal and sustainable sources." Sullivan says his company has more than 60 experts in the field who work to make sure that the products it buys comply with the law. In September, federal agents searched Lumber Liquidators headquarters and one of its stores in Virginia, a raid that included investigators from Immigration and Customs, the Fish and Wildlife Service and the Justice Department. The search warrants in the case remain sealed, but the environmental group, EIA, says the raid was connected with the allegations of importing illegal wood products. The company says it is cooperating fully with the investigation.